OK so there were no shifters, but dang Marcus was all alpha. In my mind he was a wolf. All growly and possessive. I get that he has to play the tough part, but he also was really tough and scarred and scary. Space. 3 rival houses that rule the universe. Ada, one of six children, ran away so not to be married to an idiot. She was tough before, and got tougher on the run. The Houses train their kids well. Then she is caught and meets another prisoner. Yes, Marcus. Mr Growl. Hunted killer. A bountyhunters dream catch. I already said he is all alpha and grrrrrrrr. The man has the world on his angry shoulders. Ada needs to get away. Marcus needs to get away. And the tension between these two are sizzling from page 1. True love? Eh. True lust. Always! I am sure they will live a very happily lustfilled life together. The world was interesting. The houses. The Consortium. Politics and smiling at your enemy as you prepare to stab them in the back. I do want to listen to more from this Verse. A war is coming. I smell blood. And next up is Bianca! I like the emotions and tension she puts into her narration. I can really feel Ada about to burst. She puts her soul in it. I liked her other characters too, well except for Ian. He did not sound hot at all, ha, poor Ian. I liked the differences between everyone. As the seventh of nine children, Ada von Hasenberg knows that her only value to House von Hasenberg is as a political pawn in an arranged marriage. But after watching two of her older sisters get auctioned off to horrible men, Ada refuses to play her part. She flees off-planet and disappears for two years. Ada’s father, fed up with her rebellion, offers a bounty for her safe return. The universe is a big place, but mercs are everywhere, and Ada is caught. With the merc ship full, she’s forced to share a cell with Marcus Loch, the Devil of Fornax Zero. Rumor has it he murdered every commanding officer who issued orders during the Fornax Rebellion. All anyone knows for sure is that the Royal Consortium wants his head. Ada has no trouble believing the muscled man chained in the back of her cell is a killer. But when their ship is attacked by forces from rival House Rockhurst, Ada must decide whether to trust him—because once you release the devil, you can’t put him back. And when the attack heralds the opening salvo of a much bigger war, Ada must determine where her loyalties truly lie. Mr. Growl. lol This sounds good to me. I've seen this one around. Good for Ada and getting away from marrying an idiot. Sounds like a series I'd like. I keep reading fantastic reviews for this one. Who can’t love a heroine who runs away so she doesn’t have to marry an idiot? Okay sounds like a winner, with a hot couple! I am definitely going to have to read this one. It sounds like audio might be the way to go. I'm really glad you enjoyed this! And Emily Woo Zeller is the narrator for the audiobook? I love her! And yes, Loch was like all alpha and annoying in all his testosterone-fueled protective growliness...I do not like that at all, but I get how in the romance genre that is popular. Right? It was so much fun! This sounds like a good one and I don't mind alphas. Didn't melliane read this too? Yesss! 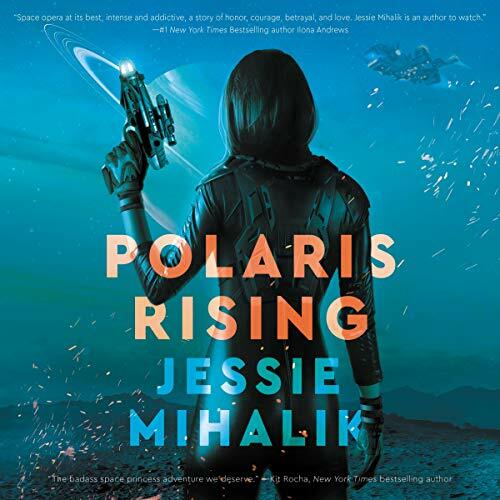 I LOVED Polaris Rising and am so excited for Bianca's story! This read was a perfect balance of sci-fi and romance for me, glad you enjoyed it too!